This is part one in a series of articles about restorative justice practices of Native American, First Nation and other indigenous people of North America. The Honor- able Robert Yazzie, chief justice emeritus of the Navajo Nation Supreme Court; Judge Joseph Flies-Away of the Hualapai Nation; and James Zion, formerly solicitor to the Navajo Nation Courts, currently domestic abuse commissioner at Crownpoint, New Mexico, Family Court. In Native American and First Nation jus-tice philosophy and practice, healing, along with reintegrating individuals into their community, is more important than pun-ishment. The Native peacemaking process involves bringing together victims, offend- ers and their supporters to get to the bottom of a problem. While contrary to traditional Eurocentric justice, this parallels the philoso-phy and processes of the modern restorative justice movement. In the Native worldview there is a deep connection between justice and spirituality: in both, it is essential to maintain or restore harmony and balance. Robert Yazzie recently retired as chief jus- tice of the Navajo Nation Supreme Court, after 18 years on the tribal bench. 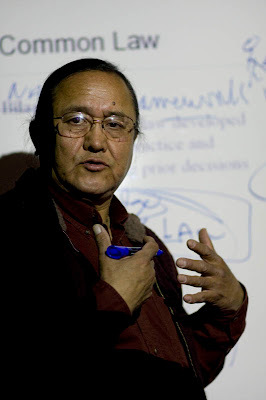 Yazzie is noted for his advocacy of the use of tradi- tional Indian law and hozhooji naat’aanii, Navajo for peacemaking, and for helping to create a law-making body and bench book to use peacemaking with domestic violence cases. He helped create the United Nations Draft Declaration on the Rights of Indig-enous Peoples and has worked to convince the United States Supreme Court to restore full tribal sovereignty. Yazzie has a degree in sociology from Oberlin College, in Ohio, and a law degree from the University of New Mexico School of Law. Said Yazzie, “I’ve been a judge all my life. I’ve handled cases; I’ve been a chief justice; I’ve written opinions; but my emphasis was peacemaking.” “I always say that America responds to crime after the fact, not before the fact,” said Yazzie. Discussing peacemaking—the tradi- tional Navajo response to crime—Yazzie said that what the Navajo have done all along, since before the Europeans arrived in the United States, is a lot of prevention—teaching and training of children. In Navajo families, par-ents and grandparents, “your mother’s clan, your father’s clan—mainly your mother’s clan—all the aunts and uncles, everybody participated in the upbringing. Somebody said, ‘It takes a community to raise a child,’ and that’s exactly what we did.” However, said Yazzie, what the Navajo have gone through historically has “hindered our ways of raising kids. The Europeans, the U.S. government, tried to destroy Navajo life—period—and it’s still going on today.” Now, he said, Navajo children are attracted to the outside world, influenced by the music industry and other cultural forces. These things, he said, have made preventive measures—trying to teach kids about the traditional life way—very hard. Those who are most successful in teaching their children are parents with a strong family life and a strong traditional-language background. Yazzie described the life way as the teach- ings of the Diyin Dine’é, the Holy People. Asked to define the Holy People, Yazzie said, “We don’t have a word for religion. We don’t have a word for God. Diyin Dine’é means the Holy People who were responsible for the creation of the world. They are present everywhere: in the fire, in the water, in the air that we breathe, the things that grow.” A number of the life way teachings are about the spirit of nature, said Yazzie. “Some of the prayers and the teachings address the significance of where the sun comes up. “For example,” said Yazzie, “Let’s say you and I got into a squabble, and you hit me over the head. In the Western world, you would be called a defendant in a criminal proceeding and would create a bad name for yourself. The Western law way is to punish you, so that you don’t repeat the behavior. But the Navajo way is to focus on the individual. You separate the action from the person. The Holy People say that the human being is a creation of the Holy People, and we have no part, we can- not destroy the human being or change it to something else. It’s not within our authority to do that. The Navajo peacemaking process helps an offender realize that what he or she has done is incorrect. The process brings the offender and the victim together to talk to each other. “The first order of business the relatives would do in the peacemaking process is to get to the bottom of a problem,” he said. “In court, I would sue you for battery and the state would say we have to prove all the ele-ments of a crime and use the rules or the law to prove that you are guilty. The Holy People say that’s beside the point. What matters here is: why did this act happen in the first place? There’s a reason why the harm has occurred. The peacemaking process is related to the concept of k’e, or respect, said Yazzie, adding, “K’e means to restore my dignity, to restore my worthiness.” Through the peacemaking process, an offender can come to feel better, said Yazzie, especially when the person can say, “‘I’m responsible, I’m ac- countable.’ That does a lot to the spirit, the mind and the body of those who participate in the process,” he said. Peacemaking can work with any problem, said Yazzie. In the Western way, he said, “you divide up things, and you say that certain types of cases should go to peacemaking. That’s what I’m hearing today. of emphasis and still a mind-set today that when somebody does wrong the only justice there is is to punish—penalty, jail mainly, some vendetta, even the death penalty. Gradually, however, there has been a movement back to the old ways, said Yazzie, adding, “Because the colonization has really done a number on us, it’s hard to undo the mind-set. What I have been doing now is trying to find ways to decolonize a style of doing things the Western way. Yazzie related some stories of cases handled with peacemaking. One case involved a death that occurred in the community. The relatives decided to do the burial at home. Some of the neighbors objected, so they went to court and sought an injunction. Said Yazzie, “The judge said, ‘Are we sure we’re going to do injunction? Peacemaking can be very effective in cases involving family matters like child support and child custody, said Yazzie. “When people get divorced they’re very bitter,” he said. “I wish parties would realize that there are chil- dren at stake. Some of them use the issues to get at each other. Some of them refuse to give visitation rights, and because there’s no visitation rights, the other person may refuse to pay. So we have that going on in court. It creates a revolving door.” He talked about a case where the father wasn’t willing to pay and the mother wasn’t willing to give visita- tion rights, so they were at a stalemate. The judge suggested they do a peacemaking, and peacemaking worked. “Why it worked,” said Yazzie, “is because the ex-wife wasn’t so much concerned about the outcome of the divorce, but she wanted to express her emotions. During the divorce proceedings she was never given that chance. The picture was damaged and he was very emo-tional about it. That did it; it broke the ice, and the boys were very emotional, and they apologized. They said, ‘We’re sorry, we’re re-sponsible for this,’ and they agreed to pay for the damage and even help the owner do some work. However, said Yazzie, the two systems can work side by side; they can help each other, and this can be done either at the federal or state court level. “I’ve had federal judges come to me to ask me, ‘How can we work together to resolve crimes committed by juveniles, minors who end up in federal court?’ I told them that we can work together; we can use peacemaking and the federal court system hand in hand to come up with solutions. And I believe we are going in that direction. As a human being it’s impossible for me to do something like that. It comes from the people themselves. It comes from everybody. That’s what we call common law, the people’s law. The experience of the people has been guided by the Holy People, way, way, way back.” Yazzie has written about the connection between Navajo peacemaking and restorative justice, citing the work of Donald Nathan-son, a psychiatrist in the restorative justice movement. Nathanson, he wrote, “tells us that as we grow from childhood, we learn scripts—ways of responding to things that frighten or anger us. These scripts fol- low what he calls the ‘compass of shame,’ relying on withdrawal, avoidance, ‘hurting self,’ ‘hurting other,’ or some combination of these. If the script is an intense one, we see withdrawal into alcohol, avoidance by becoming a street person, literally hurting others, and hurting self in drug-dependence, suicide and other self-destructive behaviors. ... Harmful scripts cannot be addressed using suppression tactics. They are best addressed by showing people the harmful effects of their conduct and the fact that there are better ways of dealing with the things that frighten or challenge them. Navajo peacemaking speaks precisely to ‘the compass of shame’ by subdu-ing harmful scripts and teaching people how to avoid hurting others.”1 Robert Yazzie’s colleague and friend James Zion has been involved with Indian law since 1975 and with the native court system for 15 years. Formerly solicitor to the courts of the Navajo Nation, he has published many articles on traditional Indian law, substan-tive aspects of traditional Navajo law and the international human rights of indigenous peoples. He is currently domestic abuse commissioner at the Crownpoint Family Court (an isolated community in northwest New Mexico) and adjunct professor in the department of criminal justice at Northern Arizona University. He holds a Bachelor of Arts degree from the University of Saint Thomas, and a Juris Doctor degree from the Columbus School of Law, Catholic University of America. A non-Indian, self-described “Montana populist,” he has been married to a Navajo woman and is fascinated with Indian customs, which, he said, “make a lot of sense for non-Indians.” Classic stereotypes portray Indians as “primitive and not bright,” said Zion. In reality, however, their “tremendously sophis-ticated thinking opens the door to looking at our own culture.” Zion discussed the difference between An-glo (European or non-Native) and Indian justice. “We are so used to presenting prob-lems to powerful decision makers (judges) for them to resolve that we cannot seem to un-derstand that there are other approaches,” he wrote. “As Professor Leroy Little Bear of the Blood Nation in Alberta once put it, ‘The law shamans of white people must be very wise, because they can find the truth based on the lies of lawyers.’”2 “Anglo law is all about rules and principles,” said Zion, whereas in Indian justice the process is very important. Disputes are resolved not by rules but by the idea of relationships. The basic concepts of Indian justice are relationships, reciprocity, solidarity and process, as opposed to hierarchy, said Zion. Central to Navajo justice is the concept of k’e, which Zion said can be loosely translated as “solidarity and reciprocity” or “what I do has an impact on you and what you do has an impact on me.” The Anglo world has a lot to learn from this concept, said Zion. This is a concept universal to indigenous people the world over, said Zion. Ubuntu, in Zulu, means the same thing. Anglos forced their court system on the Navajos back in 1892, said Zion. In 1959, the Navajos formed their own court system and destroyed the family system of justice. Zion was first hired as head lawyer of the Navajo court system in 1981. At that point, the people in charge of the court felt that they had gone too far down the Anglo legal path. They asked Zion to write the court rules for Navajo peacemaking in 1982. “They asked me to take them back to their Navajo roots. I had no idea how to do this,” said Zion. So he partnered with Navajo judges and redis-covered peacemaking. “There is some controversy about that,” he said, “because of the perception of an Anglo lawyer dealing with Navajo tradition. At the time, I did not know what the tradi-tional procedure was, so I didn’t attempt to describe it. You know the literature that has developed on it as the peacemakers revived the traditional procedure. I wrote the rules in such a way as to nourish and support the traditional procedure—whatever it was. Now, we are trying to figure it out.” Zion discovered that the old ways of justice were still being practiced “in the corners.” No one recognized that what they were doing was “alternative dispute resolution,” he said. “They just did what they had always done.” He told the story of a woman who called him up and asked him, “What’s peacemaking?” He explained it to her: people getting together to talk out their problems. “Oh that!” she said. “They understand,” said Zion. He gave an example of a case on which he acted as a consultant in Crownpoint. A large family was battling over grazing permits. Many Navajos showed up for the hearing from as far away as California, wanting apiece of the permits. The Navajo judge, Irene Toledo, shamed the group, asking, “What would your grandfathers think?” She told them to consider who really needed the permits and who would use them the best. She said she would take the case to trial, but that meanwhile, everyone had to go to peacemak- ing court. Outside the courtroom after the hearing, people were already beginning to make peace. This illustrates the concept that Indians don’t resolve matters by rules, but by examining relationships, said Zion. “I have been using my version of Navajo peacemaking in domestic abuse cases and it works wonderfully well,” said Zion, adding, “I’m finding that respondents usually admit what they do. Apology is powerful (although sometimes what was done was too serious to repair with one). Zion continued, “The procedure I use is my understanding of ‘talking things out,’ but at times, I have to instantly switch into Western judge mode. I’ve threatened con-tempt three times.” Zion mentioned that he recently presided over a Western-style adjudication trial. In Anglo mediation, said Zion, there is a concept of a neutral mediator or facilitator—someone unrelated to the parties involved. “To Navajos, that’s weird,” he said. Relatives are usually the mediators. “To Navajos, neu-trality is irrelevant,” he added. Regarding the role of the sacred in Indian justice, Zion said, “I was always leery of tap- ping into Navajo religion because I can’t know it.” He explained that prayer is important in the Navajo peacemaking process, but it’s dif- ferent from the Judeo-Christian concept of prayer. In the Indian perception, praying to a spirit compels it to be present. This is part of the idea of a broader universe of spirit forces, or animism. The process of prayer creates a safe atmosphere in which confession is compelled in the form of naming one’s problems. “What I know about this is the tip of the iceberg,” added Zion. Zion said that he disagrees with those who believe that Navajo justice practices can’t translate to other situations. They can, he said, “because Indians are human.” Being a non-Indian, Zion said that it has taken him a long time to get used to Navajo ways. “Chief Justice Yazzie is always after me for my aggressive Anglo-lawyer ways,” said Zion, adding that it has taken him a long time to learn how to moderate them. He sang the praises of young Indian lawyers who are very articulate and yet make a point of lowering confrontational lawyer behavior. “Civility is very important to them,” he said. Judge Joseph Flies-Away is a prime example of this group, said Zion. Flies-Away is an enrolled member of the Hualapai Nation, located on the South Rim of the Grand Canyon, in Arizona, U.S.A. A community and nation-building consultant specializing in justice system development, Flies-Away was chief judge for the Hualapai Tribal Court from 1996 to 1998, then associ-ate judge until 2001. He is now visiting judge at Gila River Indian Community Court of Appeals and Trial Court in central Arizona. A graduate of Stanford University in English Literature, he holds a Master of Public Ad-ministration from Harvard University and is a candidate for Juris Doctor from Arizona State University College of Law. It’s more important to him to help his people develop their own justice systems and establish community and nationhood. To that end, he currently consults for the Tribal Law and Policy Institute, a Native American-owned and operated non-profit corporation that promotes the enhancement of justice, health and culture among Native peoples, and the Native Nations Institute at the University of Arizona’s Morris K. Udall Center. Too many tribes adopt state law, said Flies-Away. “Attorneys come into tribal court and say, ‘According to Arizona law...’ I tell them, ‘You’re not in Arizona right now. You’re in the Hualapai Nation. You don’t come here and tell us what Arizona law is! I’ll give you 10 minutes to talk to a clerk and find out what laws apply.’ Sometimes there are none. It depends on where you are. There are not many rules in the Hualapai Nation.” Tribes can develop court rules on an ad hoc basis, said Flies-Away. They can decide to use what- ever parts of Arizona law they wish, for one case only, if they so choose. However, said Flies-Away, a tribal justice system is more than a tribal court. “A court is only one, though critical, component of a justice system,” he wrote. “Other usual components include the police, the pros-ecutor, corrections, probation and parole. Some tribes, however, include much more in their justice systems: ancillary services such as education, health and social sup-port. This kind of an all-embracing justice system is comprised of many human services programs that address deeper issues and not just the immediate legal matter or charge. An all-embracing justice system and tribal court pursues peace.”3 Ceremony and ritual are an important part of tribal court, said Flies-Away, and law is a very spiritual matter. When a person commits a criminal act, said Flies-Away, “People say, ‘He acts like he has no relatives.’” The purpose of law is to bring the person back into the fold, to heal him. “People do the worst things when they have no ties to people,” said Flies-Away, adding, “Tribal court systems are a tool to make people connected again.” In contrast, he said, “Anglo court processes are cold and icy.” As a tribal court judge, Flies-Away has entered hundreds of sen-tences prescribed by the tribe’s criminal code. While he had punishment in mind when he issued these sentences, he also thought about healing the hurt or sickness that might be causing the criminal behavior in the first place. The goal of these courts, it reads, is to “provide an opportunity for each Native community to address the devastation of alco-hol or other drug abuse by establishing more structure and higher levels of accountability for these cases and offenders through a system of comprehensive supervision, drug testing, treatment services, immediate sanctions and incentives, team-based case management and community support.”4 Flies-Away wrote that he is “no stranger to the spoils of alcoholism,”5 having been raised in an alcoholic community and family. As judge for his people, Flies-Away wrote, he has heard and handled many alcohol-relat-ed cases that resulted in great personal and public injury, and seen defendants return to court numerous times on the same alcohol-related charges. It became clear to him that a 30-day sentence and a $100 fine does not effectively deter abusive drinking, especially for those who are not averse to spending time in jail, and, more important, that detention does not address the underlying problems and social difficulties that the defendants face in their daily lives. To address this is-sue, Flies-Away has interpreted Hualapai laws to allow for the development of the Hualapai Wellness Court. Flies-Away is optimistic about the poten-tial of such courts, writing, “The institu-tionalization of Healing to Wellness Courts amid some American Indigenous Nations suggests that a spiritual revolution is slowly unraveling on the rez [reservation]. Some- thing stunningly spiritual is happening to indigenous North American jurisprudence. ... My perspective suggests that this ‘native’ revolution’s primary purpose is to rid the in-digenous psyche of the remaining symptoms common to a conquered and cowed people... [including] extensive alcohol and drug abuse and their related devastating crime and delinquency.”6 Tribal Healing to Wellness Courts are one way that tribes are reintegrating traditional justice practices into their culture. Another way is through community policing initiatives, which resemble traditional tribal peacekeep-ing practices where everyone looked out for each other. Flies-Away said that in some places, tradi-tional culture has been decimated, particu-larly on the east coast of the United States.However, he said, in the west and in Florida, among the Miccosukee and Seminole tribes, a lot of the old thinking remains. “Some say we can’t do those things anymore,” said Flies-Away, adding, “Of course you can’t just go back in every way.” For example, he said, traditionally in many Native American cultures, women were not part of the power structure. The challenge, he said, is “to make the old ways useful today, to help us make good decisions and be good people. You have to take from the past the things that work now.” These things can be found in stories, myth and memories, he said. Sometimes tribes have to re-create cer-emonies, said Flies-Away, but that can be controversial. He spoke of a Lakota medicine man who objected to such re-creation on the grounds that his people had been taught to do things a certain way and was afraid that change would bring bad spirits. Said Flies-Away, “I’ve been told: ‘You can’t make new songs.’ But you have to be able to create new things. Tribes “have always had things tied to the group,” he said, while Anglos stressed the importance of the individual. “The notion that we are a collection, always working on the whole tribe and how to be good together” parallels restorative justice concepts, he said. What Flies Away sees as a difference between the restorative justice movement and traditional practices is the importance of spirituality in Native American law. Away, “Sometimes we’re doing something traditional and we don’t know it.” For example, Flies-Away talked about how he went from the first year of law school to being chief judge of the Hualapai. Unsure of how to handle certain cases, he asked advice from tribal elders. He realized that in seek-ing wisdom and knowledge from them he was acting in a traditional manner. His fellow law students told him that he wasn’t supposed to do that; he was supposed to make his own rulings. But he realized that he valued other people’s decisions and wanted to make use of more than himself to decide matters. Flies-Away spoke about a Hopi medicine man who thinks that Native American phi-losophy is going to save the world. A Hopiprophecy of the apocalypse alludes to a time when a web will cover the earth. Further installments in this series will be appearing in subsequent issues of the Restor-ative Practices eForum.References. 1 Yazzie, Robert. (2000). Navajo Justice [electronic version]. Yes! Magazine, 15. 2 Zion, James W. (2000). Peacemaking: AFamily Affair [electronic version]. Yes! 3 Flies-Away, Joseph. Stretching &Strengthening—The Sentencing Spec-trum In Tribal Court. In Ha:nk Wayo:hiyu. Unpublished manuscript. 4 Tribal Law and Policy Institute. (2003).Tribal Healing to Wellness Courts: The Key Components. NCJ 188154 [electronic version]. 5 Flies-Away, Joseph. Healing to Well-ness Courts, Therapeutic JurisprudencePlus. In: Ha:nk Wayo:hiyu. Unpublished manuscript. The series is not intended to be all-inclusive, but rather a broad thematic overview. A related eForum article, “The Wet’suwet’en Unlocking Ab- original Justice Program: Restorative Prac- tices in British Columbia, Canada,” can be read at Restorative Justice Practices. The shocking revelations of abuse of prisoners by US prison guards in Iraq have been denounced by politicians around the world, including our own [war criminal], Prime Minister. The United States, Japan, China, India and Muslim nations including Saudi Arabia opposed the resolution. Burkina Faso, Cuba, Guatemala, South Korea and Sri Lanka abstained. A correctional officer, [guard], watches over the central exercise yard at Folsom State Prison. California built 21 prisons and tripled prison staff as the statewide inmate, [prisoner], population grew in the '80s and '90s.